Risk Management is not a standalone activity carried out by a company’s risk experts; it is part of the responsibilities of management and a concern to all of the organization’s stakeholders. Risk identification and management are vital to strategic planning, project development and change management. Correctly instituted, Operational Risk Management (ORM) is a cross-functional and dynamic process that is critical in helping decision-makers reach informed choices based on facts and data, not opinions. It helps management prioritize actions and distinguish the best route amid alternative courses of action. 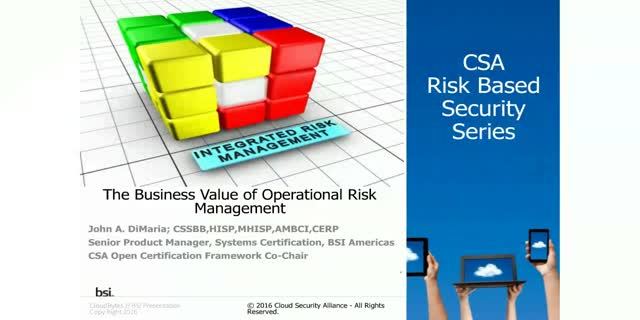 Securing information and assets is not a silo within the security or IT business unit. The benefits are many, but ORM, once implemented, facilitates reducing operational and compliance costs and provides a detection system that will help reduce future exposure to risk. Ultimately it means a more resilient organization. Some industries are under more regulatory pressure than others, but the federal government is now also pushing forward risk-based frameworks. Organizations dubbed as “Critical Infrastructure” will need to ensure they have the controls and processes in place to meet requirements outlined by risk-based frameworks such as the NIST Cybersecurity Framework.